Attention Poets, Hipsters and the lyrically inclined! 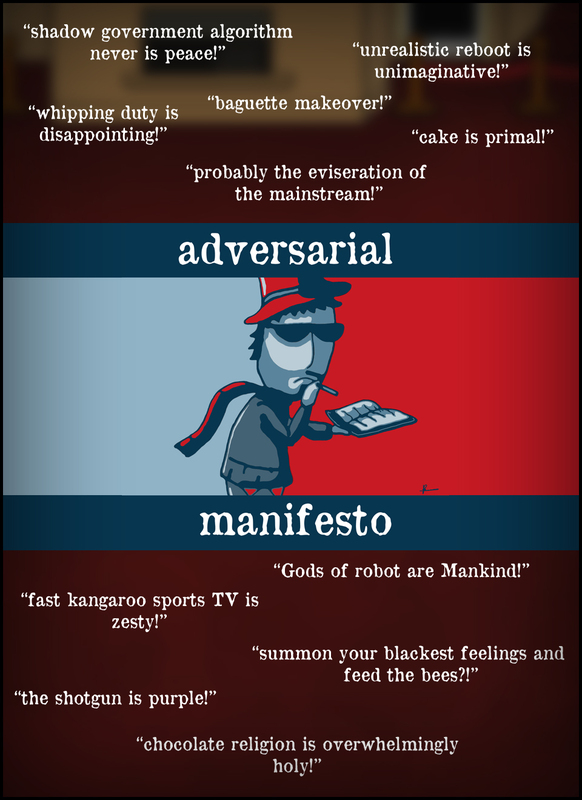 Welcome to Adversarial Manifesto - a duel of wit, where words are your weapons. This is a multiplayer party game where players attempt to outdo each other by crafting profound quotes from lists of random words. Dodge your adversaries' hail of text while you fire off words of wisdom to forge your manifesto. The game is up on greenlight, so if you like what you see please give us a vote! Adversarial Manifesto is currently in beta which is now playable online via our website. We’re using Unity Web Player, so if you don’t already have the plugin, you should get a link asking you to download it. Our game download is about 30MB. Head over to our website to have a go and let us know what you think! If you like the game please head over to our greenlight page and give it a thumbs up!